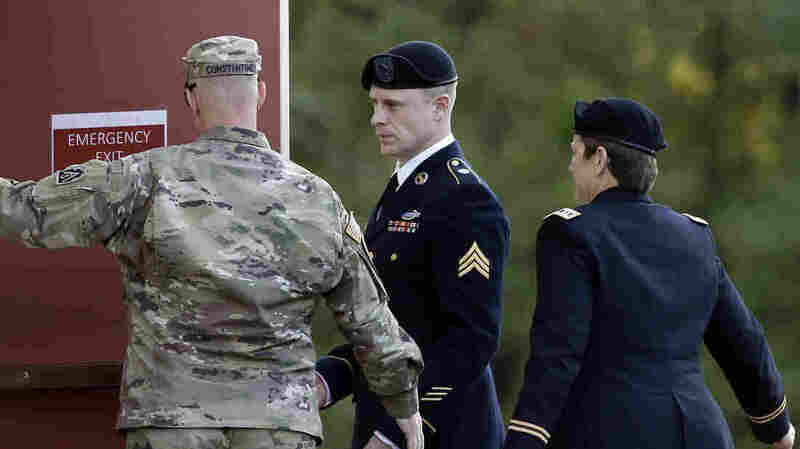 Bowe Bergdahl's Sentence: No Prison Time : The Two-Way Bergdahl, who walked off his military post in Afghanistan in 2009 and was held by the Taliban for five years, was dishonorably discharged and will lose his rank and forfeit pay. Army Sgt. Bowe Bergdahl (center) arrives at the military courtroom facility for a sentencing hearing at Fort Bragg, N.C., on Friday. The judge, Col. Jeffery Nance, had wide discretion in determining a sentence for Bergdahl, who walked off his military post in Afghanistan in 2009 and was held by the Taliban for five years. He could have given him anything from no prison time to life in prison. Prosecutors had been seeking 14 years in prison, while defense lawyers had asked for no prison time and a dishonorable or bad conduct discharge. "The judge didn't explain his reasoning; he didn't explain the mitigating factors," NPR's Frank Morris reported from the court. The military court heard testimony from three current and former service members who were wounded while searching for Bergdahl. Prosecutors argued that he deserved a significant prison sentence because those service members were injured as a result of his actions; the defense said that he did not intend for anyone to get hurt and that it was the Taliban that actually injured them. In a tweet after the sentencing, President Trump said, "The decision on Sergeant Bergdahl is a complete and total disgrace to our Country and to our Military." Trump's comments on Bergdahl have been a factor in the case. While on the campaign trail, Trump repeatedly called Bergdahl a traitor and suggested that he should be executed. He highlighted those comments again at a recent press briefing, on the same day that Bergdahl pleaded guilty to the charges. That led Bergdahl's defense to file a motion to dismiss, saying that Trump's remarks amounted to unlawful command influence. Nance ultimately decided that he wouldn't throw out the case, saying that he was "completely unaffected" by the remarks and would still be able to rule fairly. Bergdahl's dishonorable discharge strips him of his veteran's benefits. However, as Frank reported, that will automatically go to appeal with another military judge. That judge is able to mitigate the existing sentence, Frank said, but is not allowed to impose a harsher one. "I was sitting in back of Bowe Bergdahl. He was stressed, he often looks stressed though," Frank said. "You could see a big vein snaking across his temple. He was trembling a little bit after the sentence was announced." Bergdahl has been stationed at a base in San Antonio, and Frank says that now he has "a job waiting for him at an animal shelter in San Antonio. ...He's earned a reputation as someone who is amazingly good with feral cats."